This month we would like to recognize Christophe Boceno (kris_fr) for his work as a Webmaster of XOOPS France, but also for his work on XOOPS API, Browser package and on Morphogenesis theme template. I'm from France, I live in Saint-Nazaire in Breizh/Brittany but my work (safety manager) requires me to travel. This month we would like to recognize Crip Moorey (Sailjapan) for his work as a moderator of XOOPS forums, and his continues support of XOOPS users. I'm from the UK originally, but have been living in Japan for more than 20 years now. I wouldn't call what I do "Programming" more like copy-pasting and scratching my head for a bit, then trying different combinations of other people's code. Photoshop and community building, perhaps. I needed to move my site (Sail Japan) from static html pages to something that could deal with the increase in content. I tried a bunch of other CMSes but they all struck me as counter intuitive or ugly. XOOPS works like I think. Everything is compartmental but with an overarching ethos that ties all the parts together. I'm one of the forum moderators. Why? Well, someone's got to do it, and the team's a good one. Has to be sushi and beer. As long as the beer is too dark to see through. Favorites? Movies I like are: Brasil (Terry Gilliam). Razor's Edge (Bill Murray). Twelve Monkeys (Terry Gilliam) Music would have to include anything by Pink Flloyd, Camions sauvages (Amadou & Mariam), Masters of War (Dylan), Rain And Snow (The Be Good Tanyas), RATM, Public Image... & many many more. Best I can do at short notice is quote Albert Einstein: "But historic tradition is, so to speak, of yesterday; nowhere have we really overcome what Thorstein Veblen called "the predatory phase" of human development. The observable economic facts belong to that phase and even such laws as we can derive from them are not applicable to other phases. Since the real purpose of socialism is precisely to overcome and advance beyond the predatory phase of human development, economic science in its present state can throw little light on the socialist society of the future." Peter Kropotkin. Because his writings have influenced me more than any one else's. I live currently in Cincinnati, Ohio (USA), but I grew up in old good Europe (I lived in Poland, Austria, UK, Germany, and France). With breaks in between - for almost 15 years. Mainly Delphi. It was also my first exposure to Open Source (before it was even called "Open Source" ). At that time we just wanted to develop a library of free Delphi components that everybody could use. I'm trying to get better in PHP. As I said, the system architecture, its modularity, and its community. It's a fantastic piece of software, as everybody can find a module for almost anything, and use XOOPS right away. I was also able to make here a lot of friends from around the world - it's the same what made me so involved in Project JEDI. The opportunity to work with so many different people from all over the world, from different time zones and with different languages - all with the same goal: to make XOOPS the best CSM program in the world- it's an awesome feeling!!! It makes world look so small! And the beauty is that we don't care from what political system are you coming, where you live, and what language you speak - the only desire is to make XOOPS better! I'm now maintaining mainly our XOOPS site www.xoops.org, and when time permits, trying to help with documentation and testing, as well as marketing and PR for XOOPS. It used to be a lot of Taekwondo (I have a Black Belt and two US Taekwondo Championships in open sparring). Nowadays, it's a lot of Salsa dancing Scuba diving and skiing are also on my list of favorite sport activities. There are two movies I really like - "English Patient" by Anthony Minghella and "Red" by Krzysztof Kieslowski. Reg. music, my taste changed over time. I've been through a Led Zeppelin, Genesis, Yes, and Pink Floyd phase, Jazz Fusion phase (with Chick Corea and Miles Davis), then through Soul and R&B phase, and now I am back to Jazz (incl. Smooth and Brazilian Jazz) - John Coltrane, Miles Davis, Stan Getz/Jobim, Sade, Diana Krall, Chris Botti, Anna Maria Jopek. And of course, a lot of Salsa music, my favorite dance music! To take better care of our environment - because that's what our children/grandchildren will be living in, and if we really love them then we should feel responsible for what legacy we'll be leaving to them. Interestingly, the same logic applies here as in programming - cost of clean-up is much higher than cost of prevention. Probably in the Renaissance Italy, because of the beauty of art, and logic of science, both merged into one cultural experience. 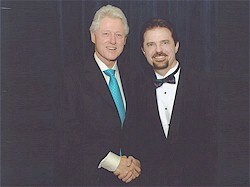 I always wanted to meet President Clinton, who I consider one of the best US Presidents. Few years ago I finally met him, and it was definitely something to remember. This month we would like to recognize Susheng Yang (ezsky), the Webmaster of XOOPS China Website. It's the Webmasters of XOOPS local support sites who make the difference for all the people who don't speak English, and is sometimes their only entry to the wonderful world of XOOPS. This month we would like to recognize Julio Napurí Carlos (JulioNC) for his continues support of XOOPS users in the Spanish Speaking Area, as well as here on XOOPS. He tirelessly cleans the Bug Tracker from the bugs, and contributes to the solutions! Muchas Gracias, Julio!!!! I'm from Peru (South America), I live in Lima in a place called San Juan! I started when I was 16 years old with Visual Basic in school. I have been programming now in PHP, Java and Python. I'm a freelance web developer, XOOPS developer, XOOPS consultant, system administrator and designer. I have more than 3 years of experience creating customized web applications for my clients. My areas of expertise include custom website design, and PHP/Python Web Applications. I also specialize in XOOPS, of course.. I think it was 2004 or 2005? And I was just starting to learn PHP, I was thinking that this actually could be something for me, since I've always been interested in creating Web Applications. I stumbled on PHP_Nuke, but I didn't liked that software, didn't feel like "me". After searching and searching I found RunCMS and Ciamos... but, in the end, thanks to them, I found my way to XOOPS. By then I knew that my beloved CMS was part of the XOOPS Community and could do some extremely cool stuff. I'm a Webmaster of the XOOPS Spanish Community Website since 2005, and I joined the Core Team a few moths ago. I also published the XOOPS Annual Report 2007 in early 2008. I am trying to spend all my free time working in XOOPS SVN, and on fixing XOOPS Bug Tracker issues. When I made a python web application for company (and I didn't know nothing) :) I learned to use rapidly. When the popular question states, “If you had to take just one CD on a desert island with you what would it be,” my answer has always been, Dave Matthews Band’s, “Before These Crowded Streets”. Anywhere, obviously with internet connection. No one special. Maybe at XOOPS Conference meeting personally some of my XOOPS friends. This month we would like to recognize Anders Kristiansen (anderssk) for his continues support of XOOPS users in the Nordic Area, as well as here on XOOPS (e.g. with his Guide to Make your XOOPS Installation even more secure). He was also very helpful during the 2.3.x testing. Thank you, Anders!!!! I was born (1973) and raised in Roskilde, Denmark. I moved to Copenhagen and lived in an apartment for 8 years. But because of many disturbances with our neighbours I moved to a little house in Hvidovre. The main reason was my 5 years daughter. She was beginning to draw “people throwing stones and fire coming up the road”. At that time she was 4 years old. Not a good environment to be raised in! I’m not really a programmer. I’m more a regular user who can read codes At my normal job I work with security. Mostly on a mainframe – the language used here is JCL. The Database behind our mainframe is a CA-Datacom. That's where I got my skills. I also have some work with Active Directory and scripting daily job in here. After working in sales, I got a job as IT-Supporter, and I think that’s my strong side. Test, test and test again. Documentation and user-manuals/how-to’s is also some of the things I have been doing for a long time. I used to create websites with Postnuke. But I got really tired of the permissions control and the need for core/module hack on every little core-upgrade. I started looking at big Danish web portals to find out what CMS-system they were made with. Many of them run on XOOPS. They were developed by Jan Pedersen aka Mitrandir. The Danish XOOPS domain was taken but not active, so I contacted the owner and he hosted www.xoops.dk for free. I like the activity on the forum at www.xoops.org. The easy template system and the permissions control is in my eyes one of the strongest things in XOOPS. That’s from my day job – moving security on CA-Datacom from internal to external security. The database environment can be accessed in 10 different ways, so each way needed to be protected. Imagine that security on MySQL. If you try to access a database with phpMyAdmin access is READ – if you try to access the same database trough a program called admin.php from www.xxxx.com access is UPDATE and so on. That was a pretty hard job and there is no help. I think only 2 or 3 companies are running the same setup as I have. If you know anyone working with CA-Datacom or CA-TopSecret please let me know. I try to find some time for geocaching. A great “game” and a reason to get out in the nature. Every year I’m a volunteer at Roskilde Festival. I’ve been at the festival for over 30 years in a row. I’m raising one of the stage tents, called Pavilion. If anyone of your is planning to go to Roskilde Festival one year, please contact me and let’s meet. The 60’. Great music, cool cars and no computers to steal your time. This month we would also like to recognize Hossien Azizabadi (Voltan) for his support and for testing/debugging of XOOPS 2.3. Thank you!!!! This month we would also like to recognize Marc Desrousseaux (Marco) for his support and for testing/debugging of XOOPS 2.3. Thank you!!!! I'm originally from the South of France (Hautes-Alpes, in the French Alps), but now I'm living in the North of France, in Lille (1hour from Paris by TGV , 1h20 from London by Eurostar). My first program was made with the BASIC language, on a Thomson MO5 in 1984, then TO7 / TO7-70 and then Amstrad CPC6128. Then I came naturally to internet and PHP in 1998. I work in the IT world as an IS Auditor in a major DIY company, making security, applications and projects audits, and as well working on some IT governance issues. Besides that I'm also co-founder of Instant Zero, so I like creating websites with XOOPS, creating XOOPS modules, and helping our customers with their projects and the XOOPS Community via the Support Forums (Xoops.org and XoopsFrance). I have created some websites, made with PHP and MySQL, after 1999, but I found less and less time to devote to their maintenance. It was necessary to offer users more functionality, but I needed more time for other activities. So I looked for other solutions. By accident, I found XOOPS at the end of 2003. I can't remember how I came to XOOPS exactly, but probably through a Boomtchak article, and I choose XOOPS instead of Spip. In early 2004 I registered on XoopsFrance, and then on Xoops.org. Its modularity, its ease of use, and its community. That's why I wrote the Xoops Manifesto some months ago. I would like us to maintain these strengths that made XOOPS a success, promote synergies through more team efforts, and to improve XOOPS so that it can better address needs of professional Websites. Well, I started to help through the forums on the French Speaking Community, aka XoopsFrance. I was also in charge of the module repository, and in parallel, I was helping module developers in debugging their modules and translating their modules into French. I helped Mith with maintaining of the module Dev.Xoops.org area. Then I decided to help in debugging the new releases of Xoops Core after the 2.2 branch was declared as not recommended. I released the Module QA Checklist, to help module developers to improve quality of their modules. We will restart this effort in few weeks. I will also update the Xoops TimeLine as soon as the 2.3 final will be released, as well as the Xoops Portfolio. Now I'm still focusing on Core, since this is the area where we have a lot to do. I'm convinced that with this new releases, XOOPS will attract again new developers and talented people. We have to facilitate and prepare for that situation. The Instant Zero modules. We had and have a lot of fun with Hervé in dreaming-up and then developing innovative solutions for our Clients and also the XOOPS Community. I will release soon a new version of the GoogleMaps module : after having played with JS and the GoogleMaps API, this new release will make a better use of the XOOPS API with some cool new features. Hiking, tripping, trekking, being with friends, making a press review with Google News. I like movies with a strong ambient music and nice images, as Gladiator or the Thin Red Line. Most of the time I go to see French comedy films. Regarding music, I do not have any preferences, it can be very eclectic but has to incite to dance. When I was a student, I regularly worked as a DJ spending some long nights spinning dance music. I also played 10 years piano and clarinet. Some of the explorers of the North and South Pole, and historians who are specialists of the Middle East area. This month we would like to recognize Stefan Zagorchev (Stefan88) for his continues support of XOOPS users. Stefan has been XOOPS Member since Sept. 2004, so it's 4 years this month. During that time he's been always very helpful providing countless advise and support to XOOPS Users. Sometimes the people who provide this kind of support are overlooked, but they are the ones who keep the community going. We hear on so many occasions that the XOOPS Community rocks because it is so helpful! It is thanks to people like Stefan that we have this positive reputation, so this moth we would like to salute Stefan and all other people like him supporting XOOPS!!! Thank you!!!! I'm from Bulgaria and live in Sofia. I started when I was about 10 years old with BASIC and Assembler on Bulgarian made Apple II clone. We needed a CMS software for a project back in 2004. So I tested most of the major CMS systems at that time. We needed a secure and flexible system and XOOPS was one of the few that offered this. The community was VERY helpful and that led to the final decision. With XOOPS I can do almost anything I need to do. In short time. And the result is stable and secure site. One thing I miss is speed. Because the support I got in forums is what bring me to XOOPS, now I try to help others the same way. Favorite dishes are too many From the drinks I like cognac and French wines from Bordeaux. Movies are too many too. The music depends on the mood, but I really like Vaya Con Dios. Don't know. But I would like to thank all the XOOPS developers and the community, who made the system what it is. This month we would like to recognize Herve Thouzard (hervet) from Instant Zero, for his his "Birthday" module. It is awesome example of the "XOOPS community spirit" - when Herve learned that Kevin, who is maintaining an Army Veterans site in UK, was looking for a modification to an old "Birthday" module, to honor their fallen soldiers, Herve offered to do a total rewrite of the module free of charge. They never met, they live in different countries, they speak different language at home, but it connects them the love for XOOPS. Herve, we salute you for helping Kevin! Herve is also the author of the best XOOPS module for news (News), in addition to many other cool modules, and a big supporter of XOOPS for years! What we appreciate most about Herve is his dedication and endless support for XOOPS. To be honest, this award was long time overdue!!! Creating websites with Xoops and also creating modules. In 2002, I've been asked to create several intranets in a very short time. After a comprehensive study of all the available CMS (I had a list of points to validate), I chose Xoops and I succeed in creating the intranets before the deadlines. Its modularity and adaptability and the fact that it's Open Source. You have also a company, Instant-Zero, that delivers XOOPS-based Solutions. What do you specialize in? Why did you come up with the idea of focusing on XOOPS? What are the benefits for an ISV? As I was working with and for Xoops since 2002, it seems natural to me to keep using it. The benefits are multiples. The first argument for our client is to say that it's Open Source. The second argument goes with the first, if we disappear you (the client) can still find someone else to maintain your site. The fact that the product exists since 2001 is important. Having a product running with PHP and MySQL enable us to use and install Xoops nearly everywhere. As I previously stated, its modularity and adaptability are two important points. Adding a feature to a website is often just a matter of minutes (and limited to a module installation) The use of themes based on CSS enable us to adapt the look and feel to the exact needs of our clients. It's also a secure solution with a good support. Always my next module But I'm very proud of Buyersguide. This module required several month for its development but it's really my best module. What's your favorite development tool(s)? I was working with PpEclipse but now I'm using Zend Studio for Eclipse. Being with my wife, reading, making the cat believe he is a killer, playing to my WII (with my wife and friends) and going to the cinema. Jazz & classical music and for the films, SciFic and comics. Alan Mathison Turing to thanks him for everything he made and to ask him not to eat the apple.